To make the great American pop album, you have to be the great American pop band. Boston's Cavedogs were just that, and outside of a few thousand true believers, their tale was an all too familiar one of misguided record label priorities and sheer mainstream ignorance. But as for the music itself, it couldn't have been better. A little over two years ago, I shared a Cavedogs 2001 "fanclub" release of sorts called Fall Back In It, a hodgepodge of unreleased rarities, demos and live cuts, delivered in the guise of a faux radio program, rife with goofy and animated dialogues. While Fall Back In It was the dessert, I had yet to serve up the main course, which I'm attending to at this very moment. 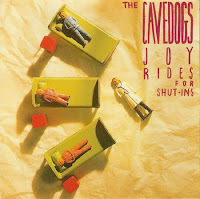 After a locally released single and a clutch of tapes sent to various Beantown radio outlets, the Cavedogs signed to Enigma Records (and soon after Capital), and in 1990 got down to brass tacks with renown producer Ed Stasium to conceive the aforementioned "great American pop album," Joyrides for Shut-ins. Almost entirely on par with their recently elevated left-of-the-dial peers Matthew Sweet, The Posies, and the Smithereens (and kinda sounding like a prodigiously brilliant amalgamation of all three) The Cavedogs Rickenbacker-laced power pop was deftly executed and eminently catchy. There was a video for "Tayter Country," and "Baba Ghanooj" was a local radio favorite, but at large, Joyrides.., and moreover the band itself, weren't afforded adequate exposure to achieve the breakout success they sincerely deserved. The public's loss and our gain I suppose, but a hell of a band to fall by the wayside. The follow-up to Joyrides... was the equally winsome 1992 Capital Records release, Soul Martini. Cavedogs bassist/mouthpiece Brian Stevens would cut a solo album in 1996, Prettier Than You. 05. What in the World? Many thanks for this. Had Steven's marvellous solo record for some time but never this for whatever reason. Just going through the back posts on your blog - some great stuff on here, thanks for taking the time to post them. What a coincidence, I just discovered them on another blog and what a great find. Did they have three albums? Thanks. Technically they had two proper albums, and the odds and ends CD, Fall Back In It that I mentioned. Great CD. Really, really great. If you have any interest in "power pop," then you must listen to this! The second CD was to me not as good. There was also the "Six Tender Moments" EP, although that might be duplicated on Fall Back In It. One of the guys worked in the mailroom briefly at the law firm I was at. Foolishly didn't talk to him and then he was gone. Just wanted to mention that "Fall Back In It" wasn't in the "guise of a faux radio program". It was in the guise of a REAL radio program! Much of the CD, including the spoken bits, was compiled from live-to-air performances they did on college stations WMBR and/or WERS (I forget which). This is an absolutely brilliant album. This is awesome-saw them open for Material Issue in Lexington, KY on the Soul Martini tour. Very nice guys to boot. Check out the video for "Leave Me Alone" on youtube. A classic! You mention Stevens album, but left out THE GRAVY, the other awesome spin-off from the Cavedogs. The Gravy's "Hangman's Pop" is kind of like the Magical Mystery Tour to the Cavedogs' Help. And the drummer also spun off into another band called Poundcake which was pretty good too! Ultimately the Brian Stevens record was good but was too polished in the way XTC's "Nonesuch" was. I just wish I knew where these dudes are now. Hi. Any chance of a re-up? Many thanks for all the great music.